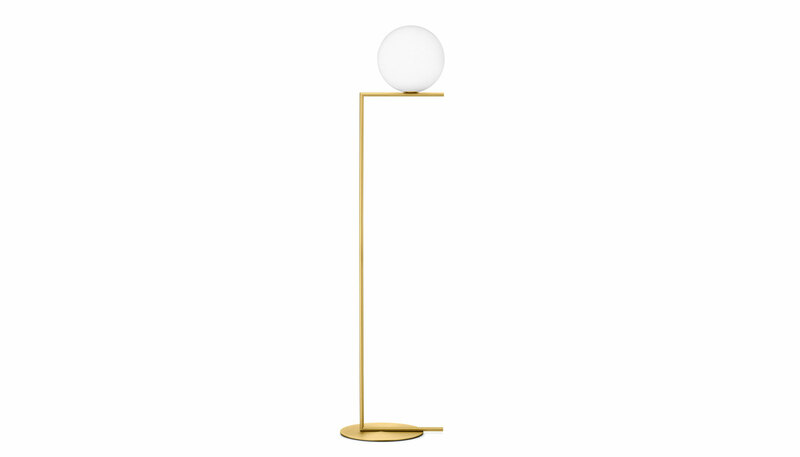 The IC Lights Floor Lamp features a round base attached to an orthogonal body, with a seemingly floating globular diffuser suspended on top. The frame is constructed in brassed steel or polished chrome steel and the opal diffuser is formed by blown glass. A dimmer is located on the power cord. Two different sized versions are available. The floor lamp provides diffused light. The lamp requires one 75 W G9 clear halogen bulb. UL listed. Manufactured by FLOS.